Join us on Wednesday July 12th 2017 from 9.30am to 1.30pm at the Huston School of Film and Digital Media (Huston Main, Room 202) NUI Galway for a free seminar. You’ll learn about enterprises working in film, TV and digital media in peripheral regions and gain insights from local speakers on policy and practice. Places are limited. Register here to secure your place. 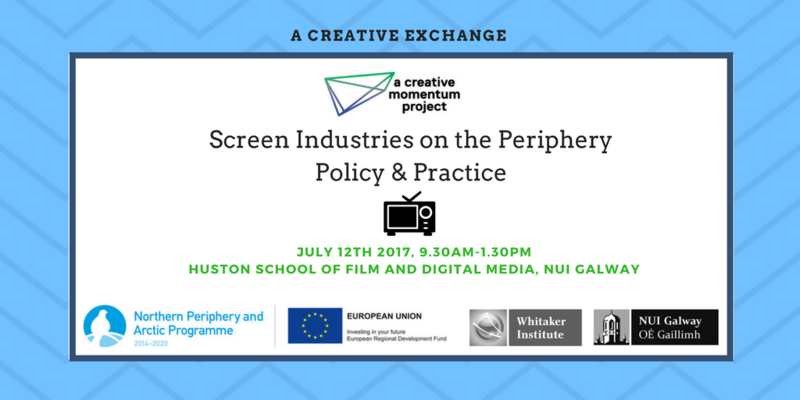 International practitioners working in the screen industries from Northern Ireland, Finland, Iceland and Sweden will talk about their work. These practitioners are in Galway to attend this year’s Galway Film Fleadh and have been supported by a creative momentum project to attend. This creative exchange seminar will include presentations, panel sessions and audience Q&A. As part of a creative momentum project, this creative exchange seminar is being hosted by NUI Galway. Working in the Screen Sector in Northern Finland and the West of Ireland. Introductions from Joonas Pirttikangas and Petteri Staven followed by Q&A discussion. Working in the Screen Sector in Northern Ireland, Iceland and Sweden. Introductions from Birna Pétursdóttir, Joe Marcus and Daniel Nordlund followed by a Q&A discussion. This creative exchange seminar is free but registration is essential. Register here to secure your place.